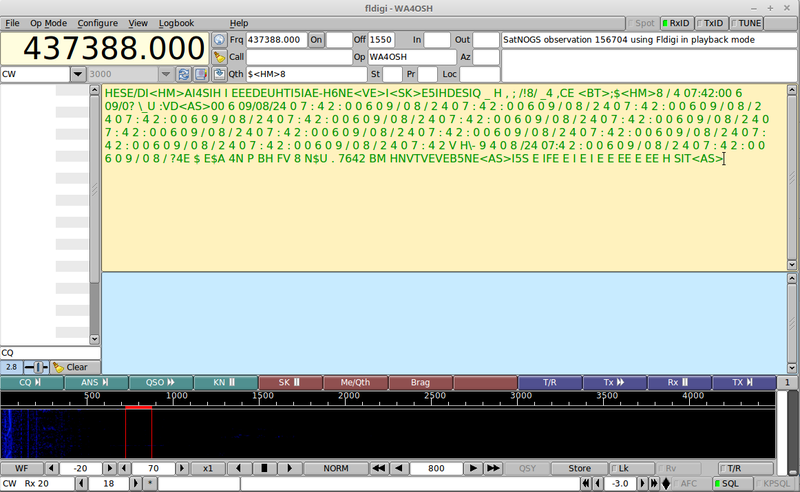 In this example, Fldigi is being used to decode the CW beacon from the 33499 - KKS-1 satellite. The center frequency is set for 800Hz and the morse code rate set around 15 +/- 2 WPM. Click on File, Audio, Playback. Then select the .wav file. Adjust the center frequency to where the CW signal appears on the waterfall display. Configure modems, CW, General. Set the BW and WPM to match the signal you want to decode. Save, close. This page was last edited on 31 January 2019, at 19:40.